Hi, I’m Bob Notman. I’ve been interested in WW2 jeeps since about 1980. I’ve owned my 1942 Ford GPW since about 1981. The jeep I had purchased was a mess when I first got it. 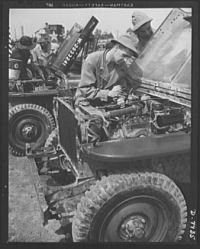 In fact it was sold to me as a 1941 “Willies.” Over the years I have discovered a lot information related to the WW2 jeep and some for vehicles other than the jeep. I’ve written or edited a number of books that are available on Amazon.com. I hope you like this website and visit my blog as well.